The concept of the recognition of states according to international law is considered not only as a difficult but also a very complex concept because of confusing combination of politics and legal instruments. By individual recognition a state gets an advantage to go to the next step, which is addmission to the United Nations family. But individual recognition is not a full recognition, because the state is limmited in terms of broader cooperation and in a way it is isolated and it does not have all the keys to operate as a fully sovereign and independent state. In order to get the keys, a state has to be addmited to the United Nations family. This is the only way for a state to be fully sovereign and independent in terms of economic, political and diplomatic relations. 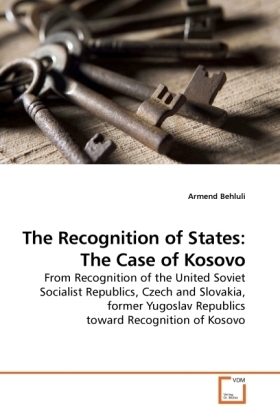 However, this thesis deals with the recognition of the former Yugoslav Republics, particularly the non recognition of Kosovo in 90s and than shift to the recognition of Kosovo in 2008. Therefore, it provides the reason why the international community did not recognize Kosovo in 1991 but it recognized in 2008.